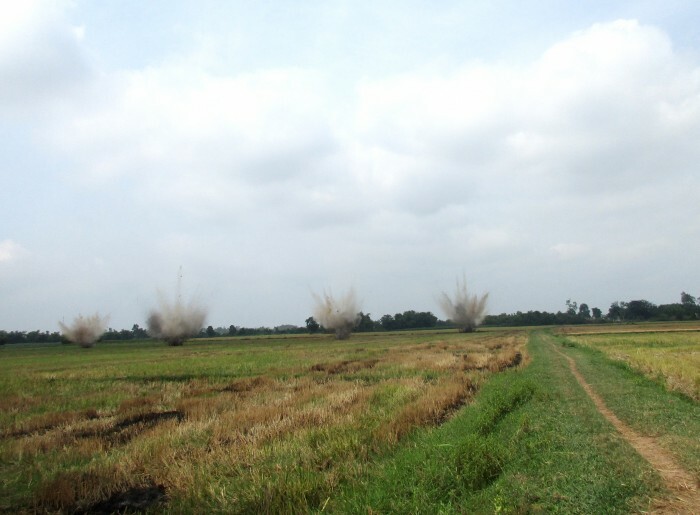 Simultaneous demolitions, as deadly cluster bombs are destroyed in place by a Project RENEW EOD team in a rice paddy in Co Luy Village. These cluster bombs were located, identified, and marked for destruction at the same site where Team Leader Ngo Thien Khiet was killed last Wednesday. Hai Lang, Quang Tri (23 May 2015) – A total of 16 items of unexploded ordnance were safely destroyed today by an Explosive Ordnance Disposal (EOD) team from Project RENEW in a rice paddy at Co Luy Village in Hai Ba Commune, Quang Tri Province. 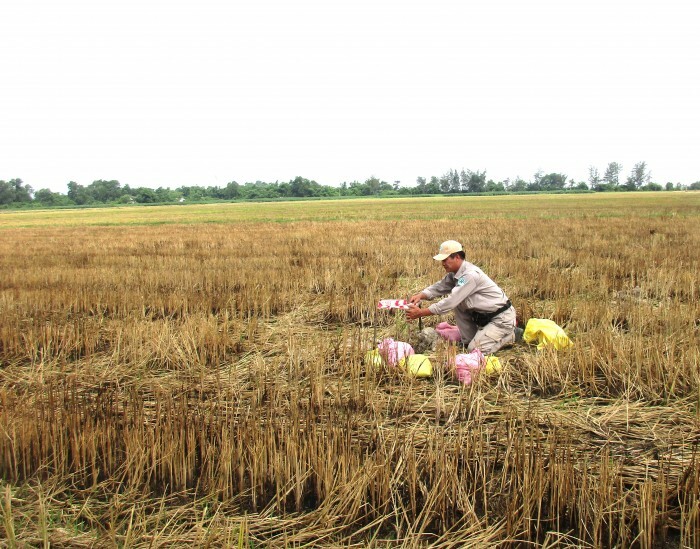 The timely EOD response has enabled farmers of Co Luy to prepare their new rice crop with peace of mind, following a tragic explosion that killed Team Leader Ngo Thien Khiet and injured technical operator Nguyen Van Hao last Wednesday. Among the deadly weapons safely destroyed on Monday were seven cluster bombs uncovered last Wednesday by Cluster Munitions Remnants Survey (CMRS) team members, who were working under the direction of team leader Ngo Thien Khiet when the fatal accident occurred. All field activity was halted immediately, and destruction of these deadly weapons was suspended. Today that life-saving work resumed, with the successful demolition of 16 unexploded cluster bombs and other munitions. EOD Team Leader Le Xuan Tung preparing for demolition of cluster bombs with professionalism and care. 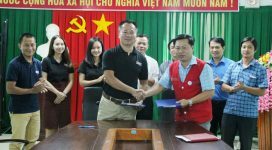 For EOD Team Leader Le Xuan Tung and his team members destroying these cluster bombs, and for local people, the EOD task on Monday was more significant than previous tasks. The people of Co Luy Village are still thinking of last week’s accident. As they begin to prepare their new crop which will soon grow into a waving green field of rice, they remember the loss of Khiet with gratitude and respect. Members of the team working at the site keep the memory of Khiet close to them, thinking of their colleague with sorrow and admiration. 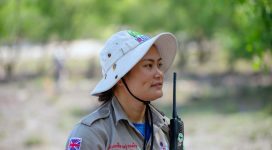 “We mourn the loss of Team Leader Khiet,” said Operations Manager Nguyen Thi Dieu Linh. “But we are determined to be stronger and more united, and to continue our work with confidence, dedicated to safety,” she said. Since the tragic accident, Project RENEW has received thousands of messages from around the world, and throughout Vietnam, offering condolences, sympathy, and understanding to the family of the deceased and to the whole RENEW staff. On 20 May, U.S. Ambassador to Viet Nam Ted Osius sent a letter of condolence which was read at Khiet’s funeral. 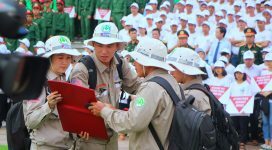 “Khiet was a highly trained professional devoting his energy and expertise towards making Quang Tri a safer place. His efforts will not be forgotten,” Osius said in his letter.